Our goal is to help you find the right kids furniture to create a stylish, functional, comfy and safe room for your child. Pumpkin Colored Kids Furniture is a Treat: That’s no Trick! If you think any of the above items on our Pumpkin Kids Furniture Design Board are Spooktacular and you want to learn more then click that link below. Have a Happy Halloween! * Sparks Activity – Orange is a lively color and when added to a kids playroom it will spark kids to be more active and playful in the space. 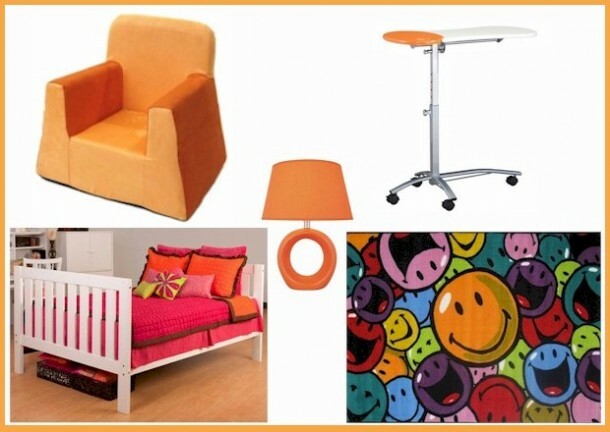 * Enhances Desire to Be Social – If your child is a little shy or introverted or likes to hang with friends then orange is the perfect color for the playroom. This color stimulates a person’s desire to communicate and get more social, so it’s the ideal color to add where kids will hang out with friends. * Instills Joyfulness – Orange (Pumpkin) is a very happy color that makes people feel joyful when they see it. * Makes the Space Inviting – When kids come to play or hang out the play space will feel very inviting if there’s orange furniture all around. * Healing Powers – Orange is believed to have healing powers and has been used by many natural healers to treat several types of ailments. So if you surround your kids with this wonderful color they may end up being healthier in the long run…it can’t hurt! If you saw all the crazy, wild colors in my house you’d flip. When walking from room to room you get greeted by new colors with every turn. I have pretty much covered the color scale by having rooms in purple, blue, green, brown, tan, yellow and bathrooms that have a mix of all kinds of whimsical shades. That’s why I’m a HUGE fan of white kids furniture. You can take a white kids bed, plop it into any color bedroom and it will look amazing. To prove my point I’ve picked four white kids beds to showcase below in a variety of room colors to show you how you can get wild with white kids beds! White Beds Look Great in Green Kids Bedrooms! I just love the contrast of white with bright green. This Sand Castle Mates Bed by SouthShore looks incredible against the green wall. The bed has a contemporary design, so it will make a green room look modern and whimsical at the same time. The two big drawers are an added bonus. Put this in any boy or girl’s bedroom to create a very modern looking space. A White Bed Makes an Orange Room Pop! The contrast of white with bright orange walls makes my whimsical side go “Oh la la, love it!” The Newbury Shaker Twin Bed and Headboard has a classic look with storage in the headboard as well as three drawers below the bed. 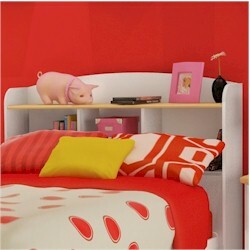 This is a great kids bed for any room where you need some storage options added to the sleep space. Purple is by Far a Favorite of Mine, Especially Against a White Kids Bed! I just want to smile and smile when I look at this white Vanilla Cream Summer Breeze Country Mates Bed by SouthShore against a purple wall. Then I want to smile even bigger because of all the other fun colors splashed on the wall art and bedding. This is one whimsical and warm looking kids bedroom and the white beds that are all decked out with storage are the final, perfect touch! I thought I’d also show how lovely white kids beds can look when paired with a neutral wall color. The White Selena Twin Sleigh Bed by Coaster would be gorgeous anywhere, but when against a neutral colored wall it creates a very sophisticated looking kid space or guest bedroom. It looks so warm and inviting that it makes me want to lie down and take a nap! Attention moms of boys! Give that wired up bundle of testosterone, otherwise known as your son, a place to chill out after a long day at school! Don’t just make his room comfy, make it stylish too and he might actually keep it clean enough to have friends hang out! A mom can dream right? If you’re not quite sure where to start, I have a suggestion…pick a style. Is your son a more traditional type of guy who wants his room to be super comfy and appealing in a typical way or is he the type of kid who wants to really impress his guests and if so, consider going more modern! To make this task easier, I’ve selected two of my favorite bedroom furniture sets for boys, one in a classic style and one with modern charm and I’ve paired these sets with accessories you could add to create a great guy space. Check out the picture below and let your imagination run wild with boy bedroom design ideas, then read on for some more info. If you like what you see continue reading to get the scoop on the furniture and accessories featured above. In the classic style I chose the Antique Black Treasures 3 Piece Bedroom Set – Twin Bed, Trundle and Nightstand by Alligator (1). 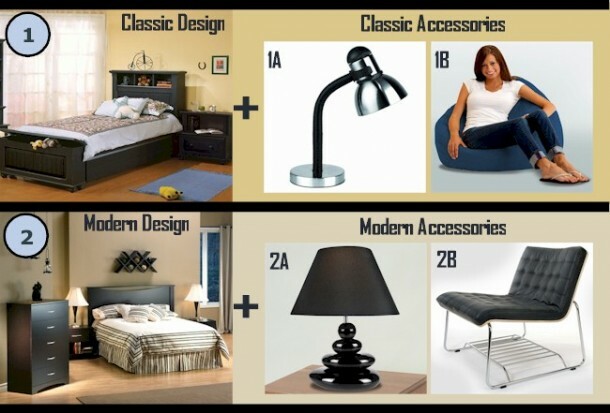 This set is classic because of the square bed and nightstand design, along with standard head and footboard on the bed. Your son will appreciate the storage space he’ll get in the headboard and nightstand. This furniture set is also great because it’s finished in a rich Black stain that goes beautifully with any wall or bedding color, so your son can decide if he wants to go with blue, green or any other color he can dream up. I’ve paired the Lite Source Henrick Metal Desk Lamp in Polished Steel (1A) with this boys bedroom furniture set because it has a classic design and would fit perfectly on the nightstand to provide enough light for reading in bed. As for classic seating, there’s nothing more traditional and fun than a bean bag chair like the Blue Sky Suede Big Bag Bean Bag by Comfort Research. (1B) Their beanbag chairs are made to last and provide optimal comfort to every sitter thanks to the top quality foam filling inside. You might want to even get more than one to give your son’s friends a place to sit! When it comes to modern you don’t get more cool and hip than the Chocolate Back Bay 4 Piece Bedroom Set – Full Headboard, 5 Drawer Chest and Matching Nightstands by SouthShore (2). I’m totally crazy about this boys bedroom furniture set because of the sleek straight line designs and decorative molding on the headboard along with fancy silver handles on the dresser and nightstand. It’s just so modish in a manly way! What’s not to love about the Lite Source Tiya Table Lamp in Black (2A). Can’t you just picture it sitting on the nightstand? The unique shape of the base makes the lamp totally contemporary and the black is just stunning with the chocolate furniture set. A room wouldn’t be modern if it didn’t have that one piece that added extra pizzazz and that’s why I included the Ebony on Walnut Perch Leather Lounge by Offi (2B). I’m nuts about the modern shape of this chair and the beautiful mix of black cushions with silver frame. The extra storage space below is just another benefit and can help your son stay a little more organized. Get a few of these contemporary seats and your son will love inviting friends to hang out. No matter which style you go with, just remember, your goal is to give your son a room that he’s proud of and it’s a win/win for you both! Good luck designing! Spark Kentucky Derby Fever in Your Kids from Birth! Are you a huge Kentucky Derby fan who wants to share that love with your kids? Do you plan to get decked out in your best Kentucky Derby garb on the big day, so you can cheer on your favorite horse in style? If so, don’t stop there! Why not create a super cool Kentucky Derby nursery, so your baby can join in the fun. We’ve put together the race horse inspired Nursery Theme board above, so you can see everything you can get to bring the excitement of the Kentucky Derby into your home! If your child likes one of this year’s horses like Alpha, Creative Cause, Gemologist, Liaison, Optimizer or Prospective (I liked those names best) then let her pick her favorite and tape the name onto one of her horses. Teach her how to clap and cheer during a race and soon your child will be begging to wear her own special hat and outfit. 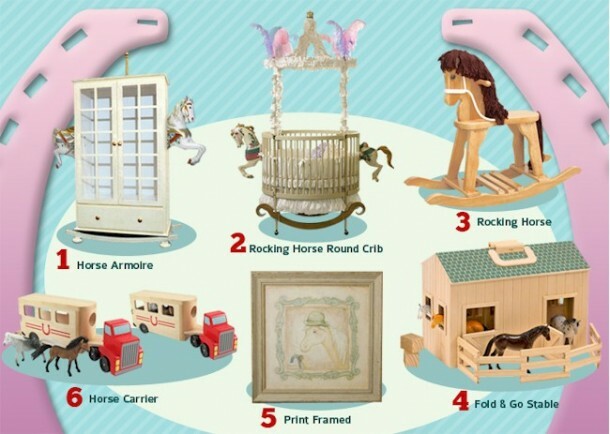 This horse themed nursery is also great for families who just love horses! So whether you’re going to the big race or just a horse fan, this is a nursery theme that you and your baby will love! To see every horse themed nursery accessory and kids bedroom item we have visit us at SimplyKidsFurniture.com today. You can also learn more about each item on the inspiration board by clicking on the name below. You’re about to learn a simple trick to create a gorgeous kids bedroom decor! The first step is to find a table lamp that excites you. Next, use the lamp’s charming design and color to spark ideas for the rest of the space. 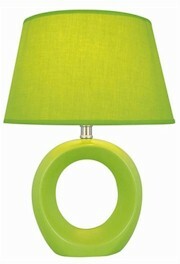 I chose the Viko Table Lamp because of its modern design and fun, vibrant color options. This table lamp is available in red, blue, green and orange. Below you’ll see a few inspiration boards I created using the blue and orange Viko Table Lamp to show how these lamps can inspire the creation of an entire room theme. 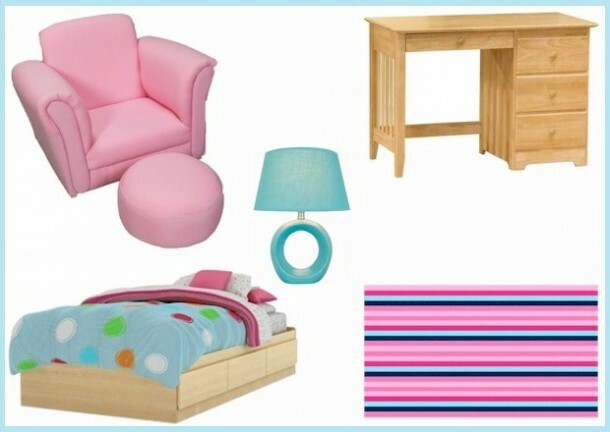 To create your own inspiration board, simply go to our online store at SimplyKidsFurniture.com and search through our beautiful selection of kids bedroom lighting solutions till you find one that catches your eye. Copy and paste that picture into any image program then look for other kids furniture that matches and do the same then voila…your inspiration board will be complete! Below each inspiration board I’ve listed the names of each item, so if you see something you like you can go check it out immediately! I hope these kids bedroom design inspiration boards inspire you to get creative and mix and match some cool kids furniture and accessories to give your child a one-of-a-kind bedroom! 5 Reasons Why Bean Bag Chairs Are My #1 Pick for Playrooms! Pumpkin Colored Kids Furniture is a Treat: That's no Trick! Love this Modern Platform Bed by Coaster! © Copyright 2019 blog.simplykidsfurniture.com. All rights reserved.